I was delighted to show my support last week for “Making Waves for the Living Wage,” a nationwide UNISON campaign calling on all UK the water companies to sign up as accredited Living Wage employers with the Living Wage Foundation. I know from my meetings with constituents that being paid less than the Living Wage is a big problem for many workers in Glasgow Central. Failure to pay the Living Wage results in people being unable to provide for themselves and their families. Research from the New Policy Institute found that less than 10% of employees in the water industry were paid below the Living Wage in 2014. I know that when I pay my water bill each month – and it isn’t getting any cheaper – I expect to see it spent on decent wages for vital staff in the water industry. 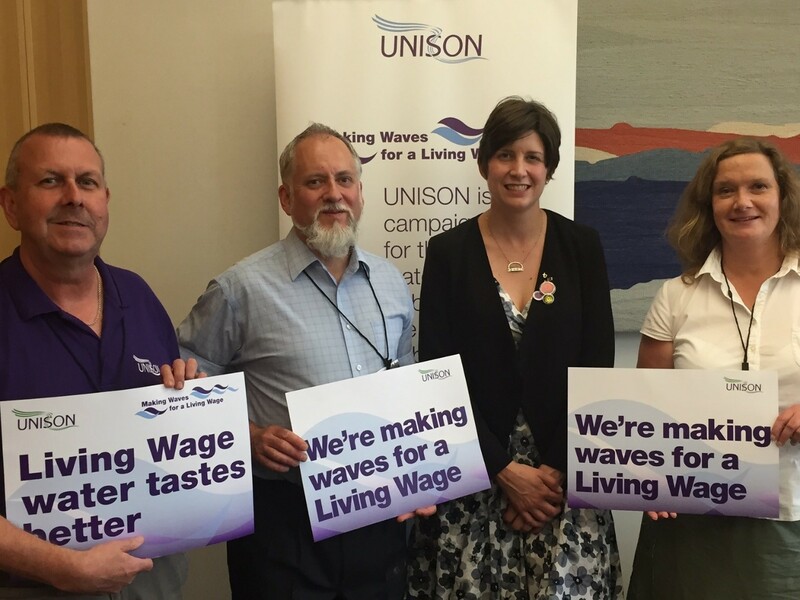 The UNISON campaign “Making Waves for the Living Wage” has resulted in six major water companies signing up as living wage employers including my local water company, Scottish Water. I believe that every employer in the water sector including customer call centre operators, catering staff, cleaners and security guards need to be paid the wages they need to live on. This is a vital campaign and I am proud to support every effort to make the water industry the leading sector paying the National Living Wage.